The hard part of making this warm, comforting bacon cheesy dip is finding a place to hide it so that it can cool a bit. Everybody wants to dig in right away! Good. But too hot to really taste the deliciousness. Put it on a cracker and wave it in the air to cool it. Better. Best — wait a bit longer until it is Goldilocks “just-right”. No burned tongue and the flavors shine. Easy to make. About 5 minutes and it is ready to pop in the oven. 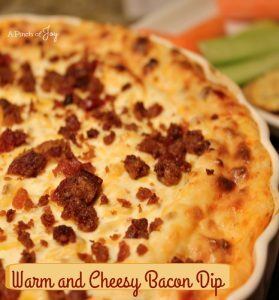 Use only precooked bacon pieces. Look for the brands with larger pieces if you can find them, as they will make a smoother, more flavorful blend. Onion can be omitted or if you want more kick, add another green onion or two. Add pepper, if desired. NO salt as the cheese contains all the salt necessary. Serve with a basket of dippables like corn chips or carrot and celery sticks. Or a tray of assorted crackers – pretzels are good too. Turn the dip out into a hollowed round of sourdough and spread the mixture on sourdough chunks or toast rounds. Makes about 36 servings of 2 tablespoons each. This recipe featured by The Tumbleweed Contessa. A warm and filling addition to the appetizer table for any occasion. Serve with bread or toast as a spreadable; crackers, chips or veggies as a dip. Beat softened cream cheese till smooth, mix in sour cream. Stir in bacon pieces, cheddar cheese and green onion. Spread mixture in 10 inch quiche pan or in 2 quart baking dish that has been sprayed with cooking spray. Bake 25 – 30 minutes until edges are light brown and top is golden. Let cool for 15-30 minutes before serving to develop flavor. Serve with bread chunks, toast rounds, crackers, sturdy chips or veggies. Can be refrigerated and reheated if needed.